Without Mackie Control Universal Pro, your music production software just isn’t complete. MCU Pro rounds out your software’s functionality to deliver the ultimate in hands-on command. In fact, your software was designed with MCU Pro in mind. Developers access the MCU Pro via its unique communication protocol — pioneered by Mackie — and determine precisely how MCU Pro works for you. That means MCU Pro integrates with your software like no other hardware controller. Say goodbye to sub-par responsiveness to your mix adjustments, trying to remember which knobs are assigned to which parameter, and the tedious process of MIDI mapping. With MCU Pro, you get deep, intuitive control of mix and plug-in parameters, real-time visual feedback and set up is plug and play — without any MIDI mapping whatsoever! And MCU Pro goes far beyond simple faders and transport controls — it gives you the most comprehensive feature set on the market. With nine Alps touch-sensitive faders, a full-sized backlit LCD and V-Pots for fast tweaking, MCU Pro is the only desktop control surface that can truly make your music production experience complete. With optional expandability via Mackie Control Extender Pro, MCU Pro is also the only software control surface that can grow with your studio. 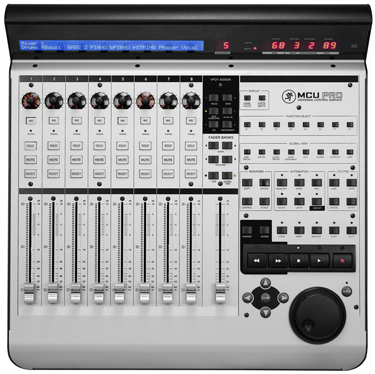 Every Mackie Control Universal Pro comes equipped with nine 100mm motorized touch-sensitive faders from Alps — one for each channel, plus a master fader — for that pro console look and feel. With support for an unlimited number of banks, MCU Pro can handle as many channels as your music production software can throw at it. Each fader channel also has a genuine Mackie rotary V-Pot, surrounded by an LED collar to indicate the current value, and dedicated buttons for record ready, solo, mute, channel select, and signal present LED. In addition, the master section includes buttons for navigating channels — individually or in banks of eight — as well as for software specific controls like assigning I/O, sends, EQ, dynamics, and plug-ins to name a few. We know it doesn’t matter to you how many applications the Mackie Control Universal Pro works with — what matters is that it works with yours. While MCU Pro is compatible with all major music production software, it is also designed to specifically work with your application — just access your software’s parameters in the master section and you can get right down to action. We even supply pre-labeled Lexan overlays for your application so it not only functions like the MCU Pro was designed for your software alone, it looks that way, too.